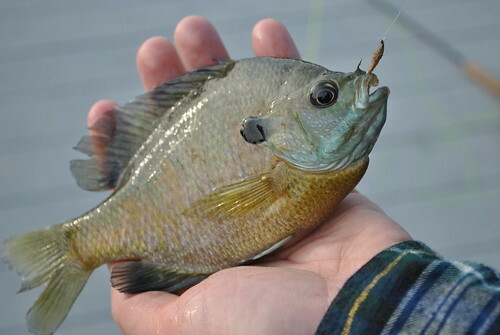 Blue Gill on the Fly: Great weekend. Between going to the zoo, craft fairs and creepy O-temples, Em and I have been fishing up a storm. On saturday night we met up with fellow poster from warmfly.com, Brian Davis, whose blog you can find in my blogroll, at the north Garland pond I have been visiting lately. 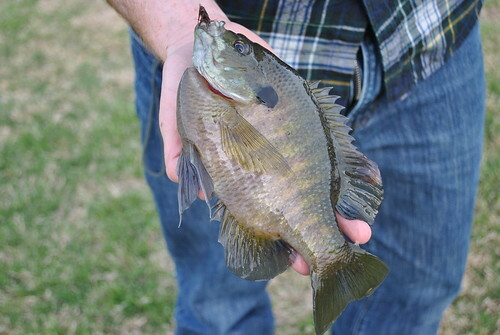 We fished for a while and discovered a new pond nearby that has some white crappie, bass and blue gills. Looks very promising. On sunday night Emalie and I stopped by the north Garland pond for a couple final casts before home and I caught this chunk. Bet you can't spot my secret to big bluegills?